In 1963, while Dale Duby was working in the woods as a timber faller, he saw a fellow logger making an arrowhead from a piece of obsidian during their lunch break. Dale became very interested in the technique and so he asked the other fellow to teach him how to make an arrowhead. 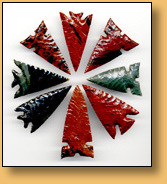 It was then that Dale began making arrowheads for friends simply as a hobby, but in 1988, while Dale was falling timber in the Seneca, Oregon area, he discovered a lot of obsidian laying around on the ground. It was then that Dale decided to start making artifacts that eventually turned into a full-time job. In 1994, Dale stopped logging and started a small business of his own making contemporary artifacts, arrowheads, knives, lances and tomahawks. Dale began marketing his own products by taking trips loaded down with months of work and finding interested buyers in many of the western United States. When it finally became too difficult to produce the product and also market them, Dale hired marketing firms to represent the company. Materials needed to produce the knives and tomahawks are obtained as locally as can be to their location. Most of the obsidian used is of high quality and comes from Central Oregon and Northern California for the most part, and comes in a variety of colors, such as mahogany, rainbow, midnight lace, clear green, Burns green, silver sheen and more. Not all colors are always available. Great Basin Art buys antlers shed annually from local deer and elk which are mostly picked up by ranchers who know the animal's whereabouts at all times. Bone handles are a by-product of the fur industry, and no animal is harmed to obtain them. Wood handles and all wood used to construct their furniture is obtained close to Prairie City, Oregon. Wood from private and public land, including juniper and pine, is harvested locally to construct their furniture. Great Basin Art artifact reproductions are available throughout the United States, although the furniture is not represented by other marketers at this time. Please contact Dale or Claudia Duby for more information regarding their products and availability. Copyright © 1998-2016 by Dale Duby of Great Basin. All Rights Reserved. Website Design by Silverton Web Works.